The Red Sea is an inlet of the Indian Ocean, between Africa and Asia. 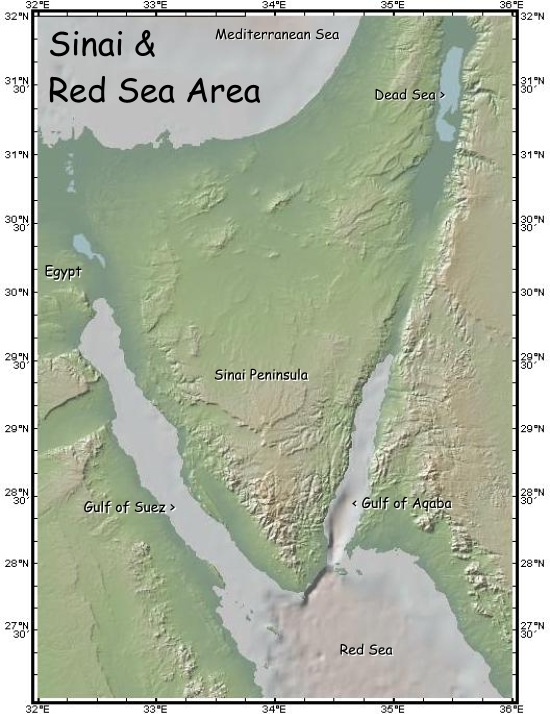 The Sinai Peninsula sits at the northern end of the Red Sea, with the Gulf of Suez to it's west and the Gulf of Aqaba or Gulf of Eilat to it's east. Yahweh turned an exceeding strong west wind, which took up the locusts, and drove them into the Red Sea. There remained not one locust in all the borders of Egypt. but God led the people around by the way of the wilderness by the Red Sea; and the children of Israel went up armed out of the land of Egypt. 4 He has cast Pharaoh’s chariots and his army into the sea. 22 Moses led Israel onward from the Red Sea, and they went out into the wilderness of Shur; and they went three days in the wilderness, and found no water. They traveled from Mount Hor by the way to the Red Sea, to compass the land of Edom: and the soul of the people was much discouraged because of the way. 10 They traveled from Elim, and encamped by the Red Sea. 11 They traveled from the Red Sea, and encamped in the wilderness of Sin. Then we turned, and took our journey into the wilderness by the way to the Red Sea, as Yahweh spoke to me; and we encircled Mount Seir many days. I brought your fathers out of Egypt: and you came to the sea. The Egyptians pursued after your fathers with chariots and with horsemen to the Red Sea. 7 Our fathers didn’t understand your wonders in Egypt. The earth trembles at the noise of their fall; there is a cry, the noise which is heard in the Red Sea. This man led them out, having worked wonders and signs in Egypt, in the Red Sea, and in the wilderness for forty years. By faith, they passed through the Red Sea as on dry land. When the Egyptians tried to do so, they were swallowed up.